Hello, cherished readers! I’m sorry it’s been so long since I last posted, but my brain has been permanently lodged in Haven’s Realm. Ever since I lost my place on the shelf, I’ve been buried in mountains of editing work. I’ve come to a very important conclusion — you have to write well into a series before you can know the culture well enough to write it. Starting with book one, chapter one, page one, I’ve rewritten the entire Haven’s Realm saga, incorporating an ever-improving writing style and all that I’ve learned during my writing adventure. Joshua MacAaron, my first vampire from the Community, was shy and reserved when confiding his secrets, and I didn’t have a whole lot of information to go on. I didn’t know who Jason was or the events leading to the founding of my noble clan until I had an opportunity to speak with the king himself. I interjected that knowledge into my first novel, giving readers a better understanding of the world they were exploring. Dragon Lord is another story that has undergone a profound change. I found while reviewing the work that I had almost completely ignored the title character. I left numerous holes — bits of plot that dropped out of sight and opportunities for character advancement that were ignored — and filling them took a lot of patience. Ronan still wasn’t talking, and I had to force it out of him. He feels much better now. Over the last three years, I’ve scrutinized each and every paragraph at least a dozen times, cleaning out unnecessary fluff and smoothing story flow. I’m sure they’re not perfect, but I expect any editor out there to put their publisher’s spin on things, and I’m good with that. I restructured two of the stories and completed two new titles. Haven’s Realm now stands eight novels strong, and I’ve begun work on the ninth. I have notes and sketches for several more after that, and I can’t wait to show it all to you. All eight titles are as clean as I can make them and ready to go. I managed to condense each massive novel into 2-page synopses — not an easy task for one who is not known for brevity. I have a timeline issue to resolve so all books are consistent in facts, and I need to polish the series outline and query I intend to send. This shouldn’t take long. I’ve also updated my website with a new look and content. After drowning in a sea of English for years, switching to html — a language I once spoke fluently — was a challenge I didn’t expect. Slipping back into the media is also going to be a challenge. I’ve gotten used to the company of my ‘friends’, and feel like an ostrich whose head has been stuck in the sand for ages. Or like Lucien, waking after a hundred years to find so much has changed. My solitary existence is coming to an end, and that is as frightening as it is exciting. I hope I can keep up! I want to offer profound apologies to every one of you who has been waiting for Haven’s return. You’ve been patient with me, and I truly appreciate that. I hope you consider the end result well worth the wait. …and, I promise to keep you posted! 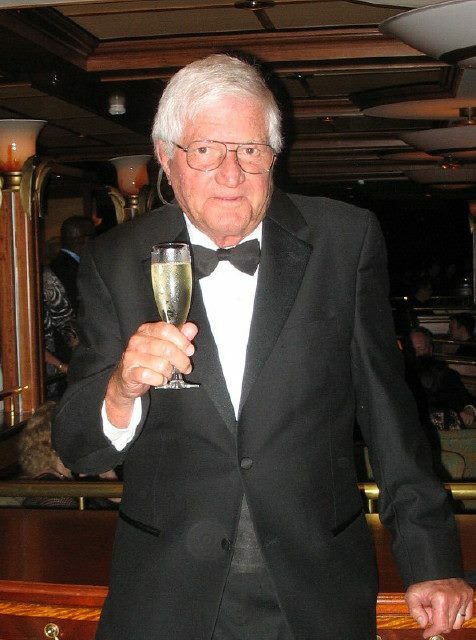 Join me today in an interview with John Austin! I’m once again on The Book Club, discussing my latest release, Midnight Skye! 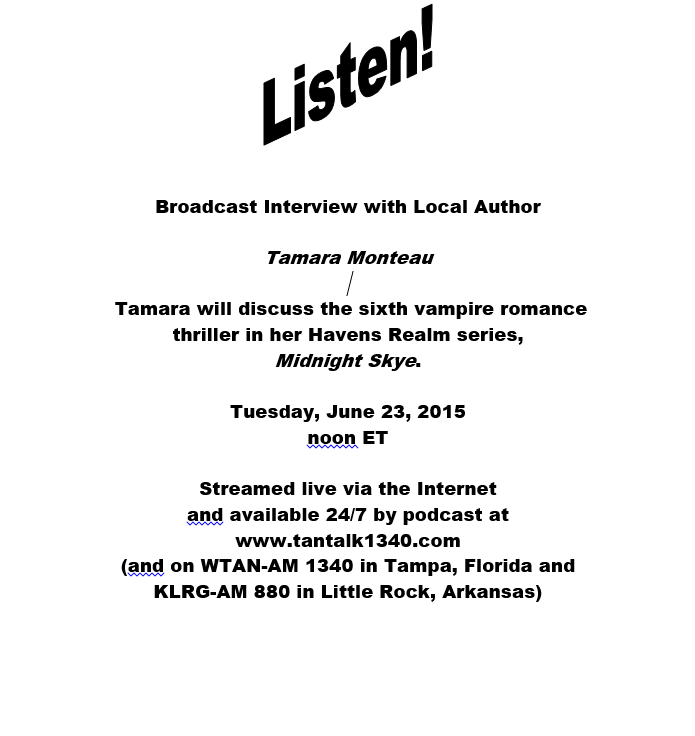 Listen to the podcast live at http://www.tantalk1340.com, or any time at http://internetradiopros.com/bookclub/?p=episode&name=2015-06-17_zbookclub_for_062315_tamara_monteau_midnight_and_skye.mp3! I like to do research online, and don’t swear by any one source. I often enjoy finding blog sites and forums I can browse through, especially when attempting to fully grasp a concept based more on myth and legend than on fact. Precious little information of any real credence was available at the time, and I really got a giggle over some of the ideas floating around in cyberspace. Research indicated that a damphere is the hybrid result of a vampire impregnating a mortal. Please note that I did not say human. I pondered this while I read several articles describing damphere bears, wolves, and even beavers, and shook my head against the irrationality. The immortal sire would have to be of the same species in order to thusly procreate, and since most animals lack a sense of romance in their mating rituals, in fact lack all but basic procreational instincts, they probably won’t find their way into Haven’s Realm. It takes a mortal woman and a willing vampire to create a vampire-human hybrid. That goes without saying. I’ve mentioned in my writings that birthing a damphere takes a great deal of willpower and fortitude. If you haven’t read my work, I’ll only tell you that Catherine, my first heroine, nearly dies in the attempt during my second story. Carrying the child would not be a problem that can’t be overcome with the best diet and exercise. Any baby draws what elements it needs from its mother’s body, so replenishing these nutrients is vital. She’ll need all her strength and endurance in the end. Mentally, damphere are aware the moment their microscopic hearts begin to beat. They develop a strong life force, feeding, unfortunately, on that of their hosts. By the time they’re ready to emerge, the mother’s life is dependently connected to the child’s. Usually, the moment the baby draws breath, his mother dies. Tragic. Thankfully, I’ve found a handy way around that problem. Consequences derived from the events in book two give two of my Council Elders unique skills. Combine this with their growing understanding of the half-breeds and their capabilities, and the hope they won’t become lethal enemies, and you’ll understand why the Council is now no longer adverse to the subject. Whether or not more children are born to my vampire family remains to be seen. The exact nature of my youngest characters is not yet clear. As I’ve said in other articles, I write what my imagined friends tell me to. At this time, three damphere belong to Haven’s Community. The MacAaron twins reached the celebration of their fourth year, and are displaying the intelligence and vocal skills of teenagers. Their bodies, right now, are growing in sync with their ages, but not their minds. Already they’ve learned how to manipulate their environment, opening doors and such, to the dismay of their parents. Little Devon has already mastered aggressive skills his father sometimes needs to circumvent. As they grow older, physical aging will slow, granting them, perhaps, centuries of life through their immortal parent’s aggressive and persistent physiology. But that is not all they inherit. Damphere typically have all the powers of the vampire, with the freedoms of a mortal. Although some suffer a mild thirst, they usually eat solid food. They have the advantage of daylight tolerance, making them potentially lethal enemies. It was one of these who killed Lysander, one time Elder and sire to Antonia, the only woman on the Council. It’s no wonder she acted the way she did on discovering Catherine’s condition. The most recent addition is a boy of nine, the product of a demented vampire’s tendencies. His mother failed to survive confinement, leaving him to the protection and support of the Chancellor of the Savant. Unfortunately, Lorenz suffers from autism, along with isolated motor and language deficiencies. Carloman and I are placing all our hopes in my uniquely talented Dragon/seer friend, Hope, that she find a way to break through the boy’s isolation and bring him out to the real world before the power growing inside him destroys himself and all those around him. I hope this answers your questions. Please feel free to ask more. In fact, I look forward to suggestions for my next article. Thank you for dropping by, Cherished Readers!